Background: Since the distribution networks are passive until Distributed Generation (DG) is not being installed into them, the stability issues occur in the distribution system after the integration of DG. Methods: In order to assure the simplicity during the calculations, many approximations have been proposed for finding the system’s parameters i.e. Voltage, active and reactive powers and load angle, more efficiently and accurately. This research presents an algorithm for finding the Norton’s equivalent model of distribution system with DG, considering from receiving end. Norton’s model of distribution system can be determined either from its complete configuration or through an algorithm using system’s voltage and current profiles. The algorithm involves the determination of derivative of apparent power against the current (dS/dIL) of the system. 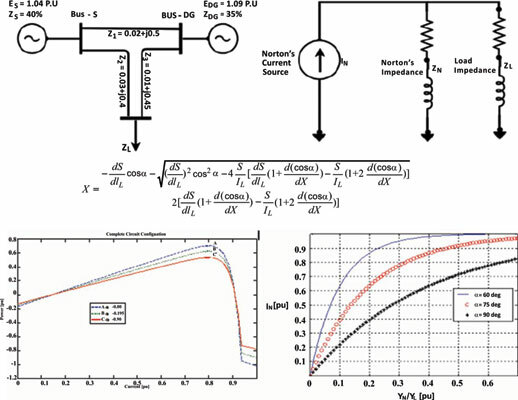 Results: This work also verifies the accuracy of proposed algorithm according to the relative variations in the phase angle of system’s impedance. This research also considers the varying states of distribution system due to switching in and out of DG and therefore Norton’s model needs to be updated accordingly. Conclusion: The efficacy of the proposed algorithm is verified through MATLAB simulation results under two scenarios, (i) normal condition and (ii) faulty condition. During normal condition, the stability factor near to 1 and change in dS/dIL was near to 0 while during fault condition, the stability factor was higher than 1 and the value of dS/dIL was away from 0. Load Flow, Norton’s model, stability margin, Distributed Generation (DG), dS/dIL algorithm, power system.